More rain in the forecast. Keep an eye out for mud and debris. And as always, take your turns slow on the Trollheim. 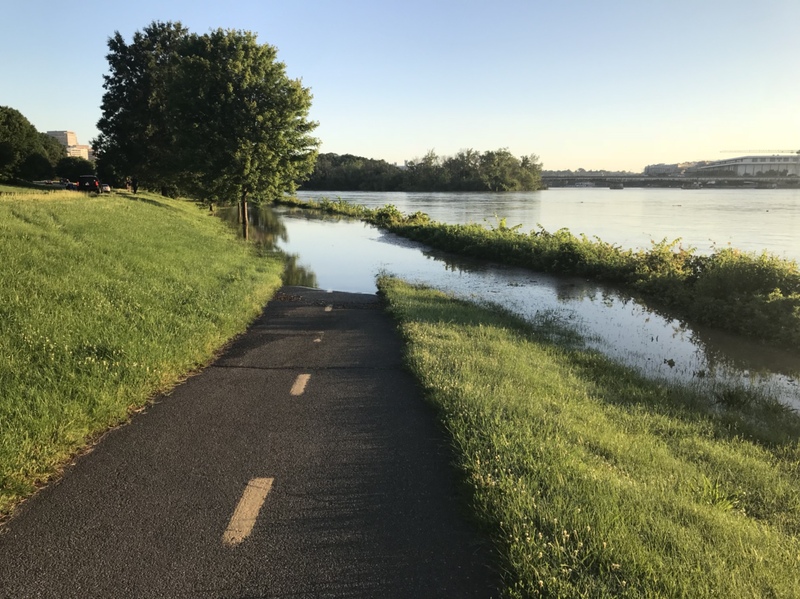 I’ve discovered—quite suddenly, and fortunately without dire consequences—that these heavy rains can leave thin patches of mud that are quite slippery: I almost lost my front wheel on one in a turn, but it was small, and I was through it in time to recover. A sheer coating of the stuff can look like nothing, and yet be extremely treacherous, so keep an eye out after even brief downpours; anywhere that excessive runoff can carry silt across pavement is a possible trap. The sand deposit can't be helped, and just needs to be cleaned up, but WTF is the enormous pipe about? I think it was intended as a barrier to keep people out when the pond level rose. But in the meantime it makes for a very challenging hop over with loaded panniers. You're just not trying hard enough - bunny hop that b*st*rd! I have learned to think about the following word for every situation when I am about to fall: faster, and steady hands. Flooding along MVT/FMR this am. Just a little opp for some off-roading!